What to do with all that Basil? Every time you cut back your basil, it comes back with a new found energy. Instead of clipping off all the pretty little flowers, go ahead and cut back your basil stems a good ways down the stem, about three to four inches. Once picked, immediately pull all the leaves off the stems, wash and spin dry. Fill the container of your food processor loosely with basil leaves and a nice little stream of olive oil. Chop finely. Turn out the chopped basil and stuff tightly using your fingers or the back of a spoon into ice cube trays. Freeze overnight uncovered. 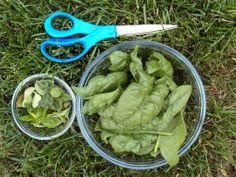 Once frozen, pop the "basil cubes" out of the trays and into ziploc bags for fresh basil all winter. Basil pesto darkens when exposed to air, so to store, cover tightly with plastic wrap making sure the plastic is touching the top of the pesto and not allowing the pesto to have contact with air. The pesto will stay greener longer that way. NOTE: To freeze, make your pesto without cheese and add it when you thaw your frozen pesto. The pesto will blend better this way.